Another Big Stock ONLY challenge for you this month. We hope to INSPIRE you to fight through the learning curve and enjoy this different creative outlet. 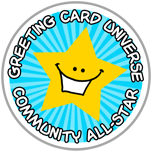 Perfect for creating greetings with subject matter you may not have or simply to add something a bit different to your current card offerings. So, August’s challenge is now in the hands of the jury so let’s get started on this new journey of inspiration! With the holiday season quickly approaching, it’s time for some fun and to let our canine friends do the talking! DOG(S) must be the visual focus in the stock image you choose. Cats will be another challenge at another time. FROM the DOG – write your own verse/message, be creative and write a message that clearly speaks from the dog. Hi Laurie! It’s been such a hot summer here, so I too am looking forward to fall. 🙂 Entry received, good luck! Here is my entry into this month’s challenge. Hope all is well with everyone. We are breaking heat records every day here in Upstate, NY! Summer was chilly and wet, now fall is thinking it is summer! We’ve had odd weather in my neck of the California foothills too. For the first time in the 37-years we’ve been married, it was in the 40’s on hubby’s birthday – the 22nd of September. Crazy! Entry received, thanks for joining in and good luck! https://www.greetingcarduniverse.com/holiday-cards/halloween-cards/from-pet/happy-halloween-from-the-dog-1494454 Hi Doreen, I am not sure if I have done this right, but it’s an attempt at an entry! Hello, Kate! Welcome to the Design Challenge, great to have you. Entry received, good luck! Hello Sathesh! It was approved within the deadline and we simply wanted to make sure that someone new to the challenge had an opportunity to officially enter. 🙂 Entry received, good luck! Hi there! Entry received, good luck!